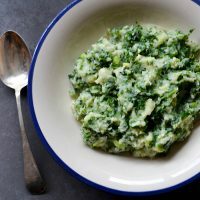 Colcannon is an Irish side dish, traditionally made with potatoes, kale or cabbage, spring onions, chives, milk and butter. 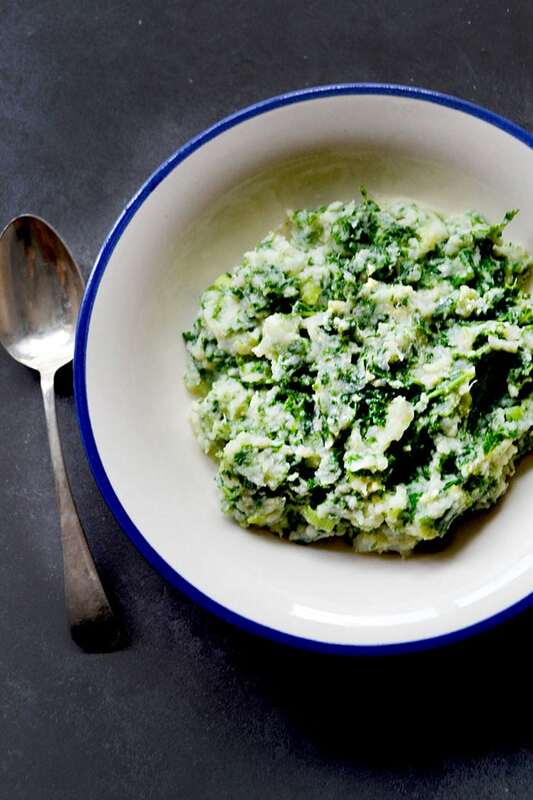 For my version, I’ve replaced potatoes with cauliflower and used dairy-free milk and butter to make this a vegan, low-carb, low-fat, low-starch and paleo-friendly dish! Mashed cauliflower is now a common substitute for mashed potato and whilst I love mashed potato, I find replacing it with cauliflower makes an equally delicious version. 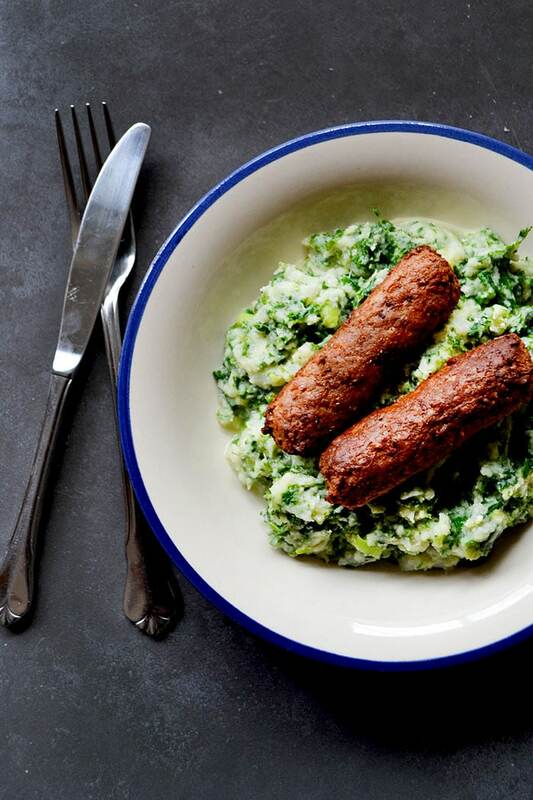 Serve with some Linda McCartney sausages (or whatever you fancy) and you’ve got a hearty, comforting and healthy meal. A twist on the Irish classic. Perfect served with some vegetarian sausages! Bring a pot of lightly salted water to a boil, add the kale and cook for 10-15 minutes until tender. Meanwhile, boil the cauliflower in a separate pot for 15 minutes until tender. Add the spring onions, chives and milk to a smaller saucepan and simmer for 5 minutes. Once the kale is cooked and drain well, removing any excess moisture. Drain the cauliflower, removing any excess moisture and mash well. If you prefer a smoother mash, use a food processor or hand held blender to puree the cauliflower. Stir in the kale, milk with spring onions and chives, half of the butter and some salt and pepper. Taste and add more if needed. Serve warm with the rest of the butter melting on top. Perfect accompanied with some vegetarian sausages! Almonds are technically a seed. Thanks Anki, so glad you enjoyed it :-) And love the idea of using the purple cauliflower... I think that would be perfect for Halloween (when this dish is also traditionally eaten)! I've never tried this before but it sounds fantastic! Love all the green, it's perfect for St. Patrick's Day! I'll definitely be making it for St Patrick's Day dinner! I have never heard of this dish! But I love all of the ingredients in it! It looks delightful! Looks great, I also am a big mash fan and this looks great for something a bit lighter. Plus added bonus- no peeling potatoes! 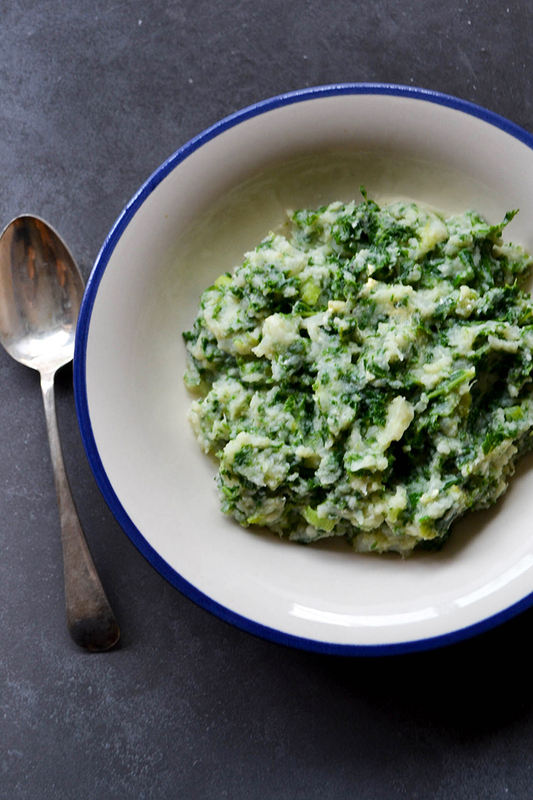 This recipe is just in time for St Patrick's Day! I love it! Sounds delicious too; I really enjoy cooking with cauliflower. I am like you in that I love potatoes but cauliflower is a great substitute. I prefer it when I am trying to eat a little lighter than usual (like right now, the month before my wedding). Looks like I'll have to whip this one up in a week or 2! Thanks for sharing! Great idea! Shall try this, this weekend, I don't have any vegan spread, so it might not be as luscious as yours looks, but I'm gonna try.